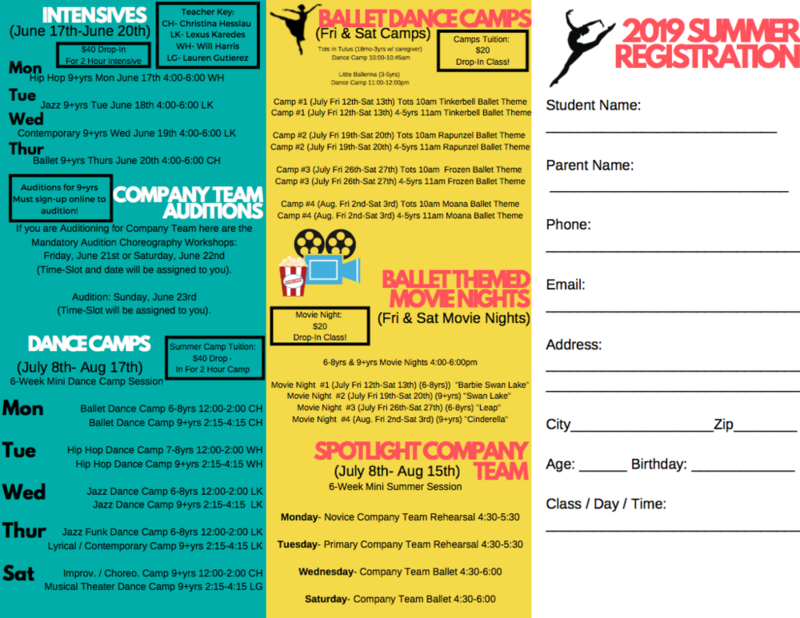 Dance Camps for 6-8yrs & 9+yrs July 8th-August 17th (240) Full 6-Weeks For 1 Class ($40 Per Class) Drop-ins Welcome MUST Register Online Prior to Class! Friday & Saturday Ballet Dance Camps ($20) Per Class. Drop-ins Welcome MUST Register Online Prior to Class! Friday & Saturday Movie Nights 4:00-6:00pm ($20) Per Drop-In Movie Night. MUST register online. None Movie Night #1 (July Fri 12th) 6-8yrs "Barbie Swan Lake" Movie Night #1 (July Sat 13th) 6-8yrs "Barbie Swan Lake" Movie Night #2 (July Fri 19th) 9+yrs "Swan Lake" Movie Night #2 (July Sat 20th) 9+yrs "Swan Lake" Movie Night #3 (July Fri 26th) 6-8yrs "Leap" Movie Night #3 (July Sat 27th) 6-8yrs "Leap" Movie Night #4 (Aug Fri 2nd) 9+yrs "Cinderella" Movie Night #4 (Aug Sat 3rd) 9+yrs "Cinderella"